In this section, you will create a new Java class and add methods using code generation actions. 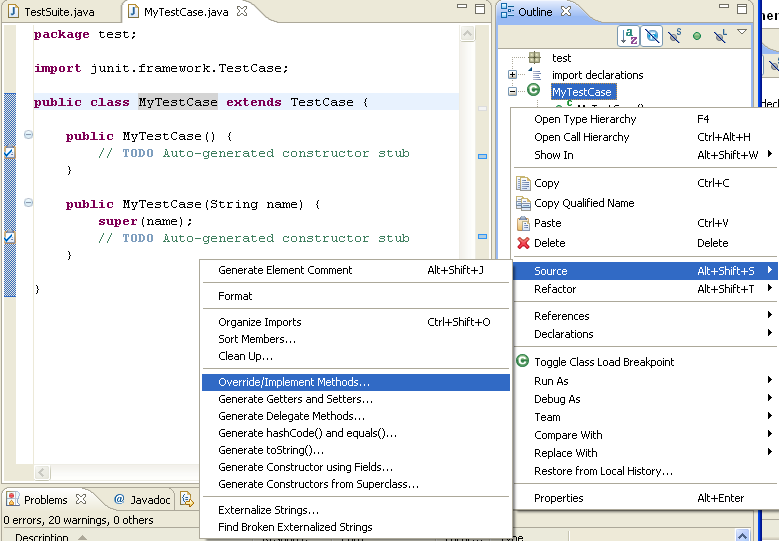 In the Package Explorer view, select the JUnit project. Click the New Java Package button in the toolbar, or select New > Package from the project's context menu . In the Name field, type test as the name for the new package. Then click Finish. 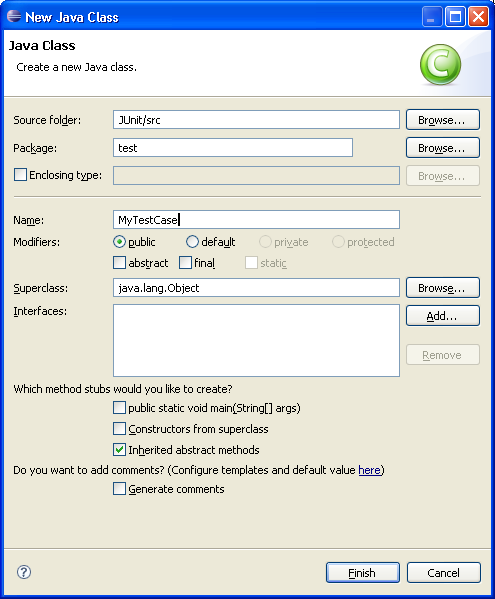 In the Package Explorer view, select the new test package and click the New Java Class button in the toolbar. Make sure that JUnit appears in the Source Folder field and that test appears in the Package field. In the Name field, type MyTestCase. Click the Browse button next to the Superclass field. 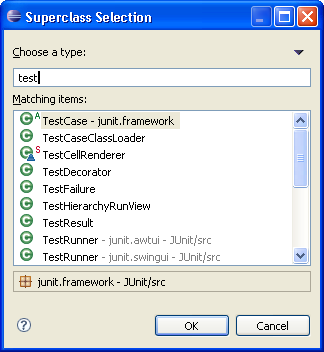 In the Choose a type field in the Superclass Selection dialog, type Test to narrow the list of available superclasses. Select the TestCase class and click OK. Select the checkbox for Constructors from superclass. Click Finish to create the new class. The new file is opened in the editor. It contains the new class, the constructor and comments. You can select options for the creation and configuration of generated comments in the Java > Code Style > Code Templates preference page. 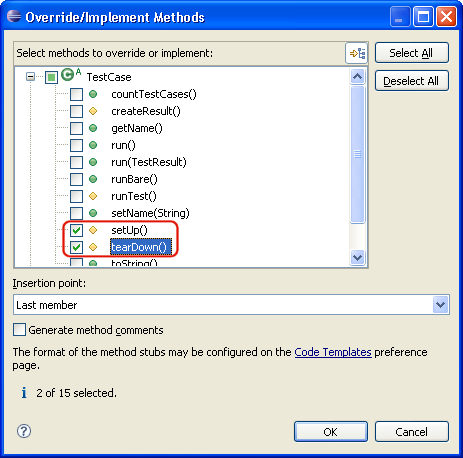 In the Override Methods dialog, check setUp() and tearDown() and click OK. Two methods are added to the class. container and Vector are underlined with a problem highlight line as they cannot be resolved. A light bulb appears on the marker bar. Move the mouse over the underlined word Vector. A hover appears that shows the error message and contains quick fixes. Move the mouse into the hover and click Import 'Vector' (java.util). This adds the missing import declaration. The blinking cursor should still be on the line that contains the error (if not, set it to the end of the line). Press Ctrl+1. This lets the cursor jump to the nearest error location and opens the quick fix proposals. Choose Create field 'container' to add the new field. 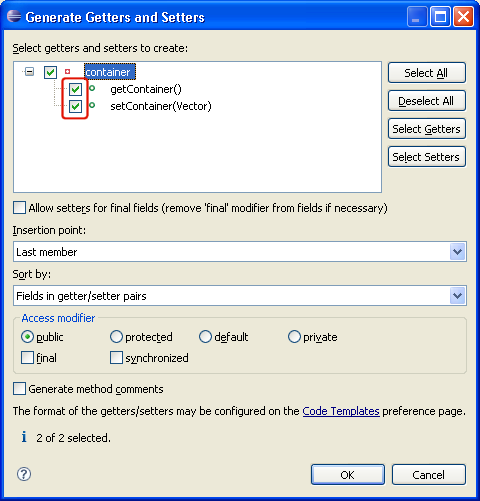 The Generate Getter and Setter dialog suggests that you create the methods getContainer and setContainer. Select both and click OK. A getter and setter method for the field container are added. The formatting of generated code can be configured in the Java > Code Style > Formatter preference page. If you use a prefix or suffix for field names (e.g. fContainer), you can specify this in the Java > Code Style preference page so that generated getters and setters will suggest method names without the prefix or suffix.